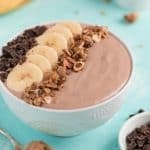 Start your day with a Chocolate PB Smoothie Bowl that is high in protein and super delicious. Place yogurt, banana, peanut butter, milk, cocoa powder, and ice in a blender and puree until smooth. Pour into a bowl. Top with sliced bananas, chocolate, granola, and drizzle with peanut butter.